What is the best way to process customer payments for your business? There several ways that you can process customer payments in Microsoft Dynamics 365 Business Central. Two of the options allow you to post a payment without applying it to an invoice(s) or memo and process the application later. The third option requires you to select the invoice or memo. Any time you process the receipt of cash, you should consider how it appears on the bank reconciliation. This blog will review each Dynamics 365 payment processing method so that you can decide which works best for you and your company. 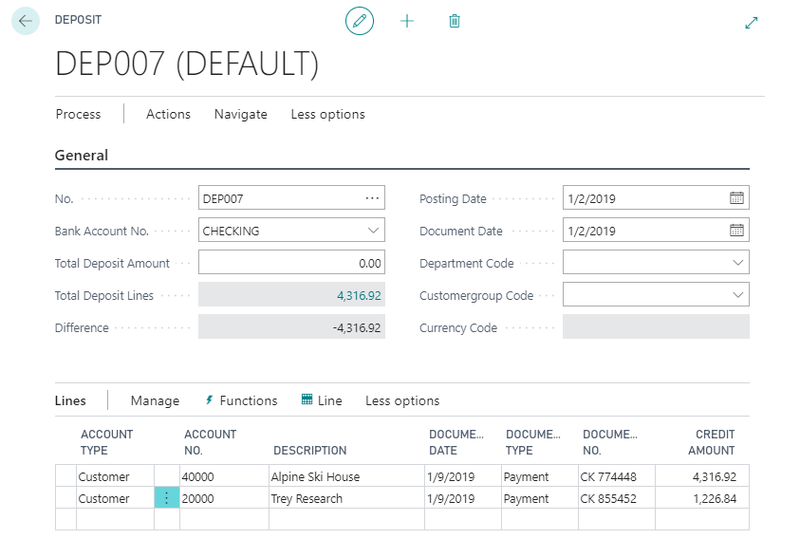 The first and most obvious means of processing customer payments in Dynamics 365 Business Central is the Cash Receipts Journal. When you use the Dynamics 365 BC Cash Receipts Journal, you can either apply to one invoice (first line) by selecting the “Applies to Doc. No.” on the line, or several invoices (second line) by using the Process Tab > “Apply Entries” function. In order to make this appear as a one-line deposit entry on the bank reconciliation, you need to remove the balancing account on each journal line and add one line at the end for the bank account as shown below. The second method of processing customer payments is with a Deposit. When you use the Deposit Screen in D365 BC, you list the total deposit amount, then each line represents a check received. You can apply this check to one or many invoices. If you use the North American Bank reconciliation, this appears as a collapsed deposit. If you use the Bank rec with auto match feature, this lists each line separately, which makes it more challenging to reconcile. A quick and easy way to process your payments in Dynamics 365 BC would be to use the Register Customer Payments screen. In this scenario, you would first add the payment information to the related document it is paying. Then, enter the amount received, so that if is more or less than the Remaining Amount, this will be reflected in the posting. If you post payments not as a lump payment, it appears on the bank rec as separate lines and does not show the check number in the reconciliation. You can utilize an automatic bank feed on this screen to import in your bank statement transactions and use the auto match feature. To do so, you will need to enable the Envestnet Yodlee Bank Feed and link your bank account. The Payment Reconciliation Journal page specifies incoming or outgoing payments, that have been recorded as transactions on your online bank account. These payments can be applied to their related open customer, vendor, and bank account ledger entries. The lines in the journal are filled by importing a bank statement as a bank feed or file. You can choose to just post the payments, or to post the payments and reconcile them at the same time. If you have any questions about processing customer payments or other Business Central features, contact the Dynamics 365 consultants at Velosio.